So my uncle Jim was diagnosed with late stage multiple myeloma, a blood-plasma cancer with a max prognosis of four years. He’s not in particularly good health already, so he’s dealing with cancer and chemo on top of other complicating factors, like liver failure. My cousin has made up a page to keep us all updated since we live scattered all over. It’s so hard to be going through this. Too many members of my family are sick or dying or gone these days. This photo is from around 1981-1982, when the youngest three of the cousins were not yet born, and Hooti hadn’t yet gotten married. Top row, from left to right: Hooti, my grandma, my grandpa, Travis, Jim. 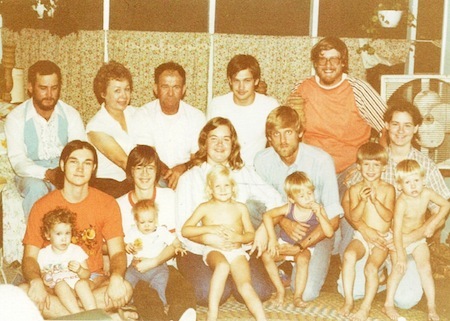 Second row: my dad, my mom, Belinda, Greg, Karen. Kids: me, my sister Becky, Jen, Jacob, Byron, Nathan. I chose this picture, rather than a later one that would include my aunt Cheri, step-cousins, and the younger cousins, for a specific reason. When I was around this age (about 2-3 years old), my Uncle Jim was my very favorite uncle. He was tall and strong and could swing me around. I felt safe with him and always wanted to go to him first when family got together. I only remember snatches from that time period, but I remember that. On my dad’s side of the family, his youngest sister, Mary, was my favorite. On my mom’s side, it was my uncle Jim. Unfortunately, I haven’t gotten to see much of Jim since I became an adult. After Morrigan was born, I moved up north for about five years. By the time I moved back down, my aunt Karen was already having a lot of problems (heart attacks, strokes, other problems likely related to the genetic high blood iron disorder that runs in my family), and I didn’t get to see that branch of the family as often. Karen passed away in 2009, and I’ve only seen Jim maybe 3-4 times since then. That makes all this particularly hard. I’m glad I got to go see him on the 1st, and I hope I have more opportunities to do so before it’s too late. **My uncle’s real name isn’t Hooti. It’s Leonard, like my grandpa, but everyone called my grandpa Metz (“meats”) and my uncle Hooti. I have no idea why. It’s just always been that way. I’m so sorry to hear about your family members diagnoses my friend. I will certainly keep you and your family in my prayers and thoughts. It’s amazing that you are so open about your family and I would like to say thank you so very much for sharing it truly helps to know about other’s and what they are going thru. You’re a phenomenal young lady and I am thankful to call you friend please if there is ever anything I can do I’m willing. Thanks for the post. Focus on all those good memories, girl. The sad part about getting older is that our loved ones are doing the same. It is never easy to see them getting sick, and it certainly is not something they mention about the aging process. Cherish your family and your get-togethers with them. You are so lucky to have such a close family; too many of us don’t have that. Sorry to hear about your uncle Jim, Amanda. My mom was diagnosed with Multiple Myeloma as well many years ago. She was EXTREMELY ill and had to undergo chemo and also a stem cell transplant. She lost all of her hair, lost weight, lost her appetite, was often bed ridden for long periods of time — she was not herself at all. Luckily the doctors caught it early enough to treat her. Thank God she survived. I’m very close with my mom and her death would have broken me, especially at that time. Thank you all. I never know from day to day how things will go, so I’m just trying to take it little steps at a time.